Hi everyone! 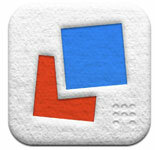 This will be the second app I am going to review and it’s called Letterpress – a word game for your iPhone and iPad. There are twenty-five white letter tiles where you can assemble a valid word to submit and earn points. To play the game, you have to login your Game Center account. You need this to auto-match with game players around the world. Then, from the 5×5 letter tiles with random letters, create a word by tapping anywhere on the board. After that, tap submit. The tiles will turn blue or red depending on your color. Like all of other word games, there are certain rules to follow: words must have at least two letters; words may only be played once; and, words may not be a prefix of a previously played word. You will earn points from each tile you turn into your color. However, your tiles may still be used by your opponent and turn them into their color. To defend your tile(s), surround it with other tiles of the same color. Players may use defended tiles but they won’t change color. Thus, they won’t earn point in that tile. There are three ways to end the game: all of the tiles must be turned to a color; the game will also end when both players pass their turn in a round. To win the game, you must have plenty of tiles of your color. The player with the highest score wins. I’ve been playing this game for about a week already. It helps me to improve my vocabulary and guessing skills! Sometimes, when it seems like you can no longer create a word, you try to guess one then submit it. Unlucky if there is no such word but sometimes you’ll also be smiling and tell to yourself, “wow! a word like that exists?!”. Both an advantage and disadvantage to this game is there is no time limit, do whatever you want in between. Pro: you can take time to think and try a word to submit. Let your opponent wait. Con: Obviously, you will also wait for your opponent as he also uses his time to think and submit his word. You won’t even know if he still wanted to continue the game or not. If you happen to be bored in waiting, the third way to end it is to resign. It costs $0.99 to upgrade the game. With that, you can play many games at once (as the free one only allows you to play up to two games at once), see played words and change themes. This entry was posted in Random Million and tagged app, app review, games, puzzle. Bookmark the permalink.